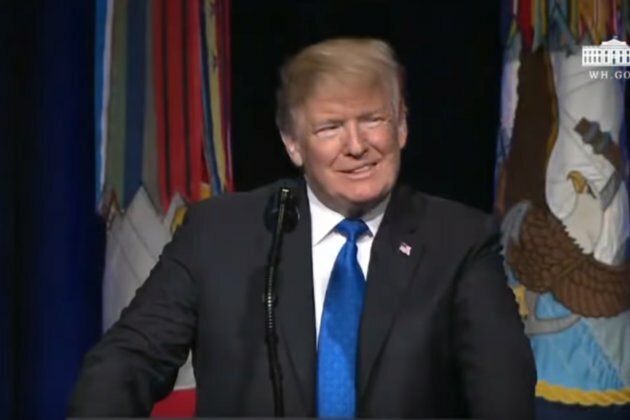 WASHINGTON, U.S. - After a year of delay, the U.S. President Donald Trump unveiled the country's first overhaul of American missile defense doctrine in nearly a decade, identifying the evolving threats facing the nation. The 108-page unclassified report, called the missile defense review, was unveiled at the Pentagon on Thursday, in which, Trump called for enhanced missile defenses. According to officials, the report emphasizes the need for a "comprehensive approach to missile defense against rogue state and regional missile threats" and calls for the development of new technologies to its system in the future. In remarks preceding Trump, the Acting Defense Secretary Patrick Shanahan and Vice President Mike Pence stressed the need to enhance America's missile defense systems. Shanahan said, "Our nation does not seek adversaries, but we will not ignore them either." Then, speaking at the Pentagon, Trump said, "Our goal is simple, to ensure that we can detect and destroy any missile launched against the United States anywhere, anytime, any place." In the missile defense review, which was delayed last year reportedly because of sensitivities about how to frame threats posed by China, Russia, North Korea and Iran, Trump stressed on the evolving threats from China, Russia, and Iran, while prominently singling out the "extraordinary threat" emerging from North Korea. He added, "The world is changing and we're going to change much faster than the rest of the world. We need strong borders. We need strong barriers and walls. Nothing else is going to work." Trump added that the country could not"simply build more of the same or make only incremental improvements." According to officials, the report also elaborated on the new technologies already being developed by a number of the world's biggest military regimes. The report pointed out that the North Korean leader Kim Jong Un's missile systems have given the isolated state "the capability to strike U.S. territories, including Guam, U.S. forces abroad, and allies in the Pacific Ocean." Experts have earlier noted that despite the historic meeting between Trump and Kim Jong Un, North Korea is still working on new missile development projects. Further, the country is the only nation to test nuclear weapons in this century. The report unveiled by Trump on Thursday noted, "While a possible new avenue to peace now exists with North Korea, it continues to pose an extraordinary threat and the United States must remain vigilant." Meanwhile, in his speech, Trump lauded his own progress made in Iran. The U.S. President said, "What we've done to Iran since I've become president is rather miraculous. I ended the horrible, weak Iran nuclear deal, and I will tell you Iran is a much different country today than it was two years ago. It's not the same, and it won't be the same, and I do believe they want to talk." Commenting on Russia, Trump said that the country has violated the Intermediate-Range Nuclear Forces, or INF Treaty, by building and fielding the banned weapons "for many years." In October last year, Trump announced his decision to withdraw from the decades old treaty that eliminated an entire class of nuclear weapons from U.S. and Russian arsenals. Further, the Missile Defense Review reportedly recommended studying experimental technologies, including prospects for space-based weaponry that might be able to shoot down enemy missiles. The report also calls for investments in space-based sensors that can better detect and track incoming missiles. Trump said, "We will protect the American people from all types of missile attacks. In the past, the United States lacked a comprehensive strategy for missile defense that extended beyond ballistic missiles. Under our plan, that will change. The U.S. will now adjust its posture to also defend against any missile strikes including cruise and hypersonic missiles." He added, "We are committed to establishing a missile-defense program that can shield every city in the United States. And we will never negotiate away our right to do this." The initiatives that have been outlined in the missile defense review must now receive the backing from Congress in order to be implemented.